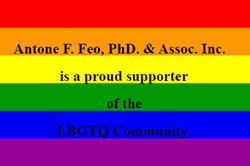 Antone F. Feo, Ph.d & Associates, Inc. - Antone Feo, PhD & Associates, Inc.
We at Antone F. Feo, Ph.D. & Associates, Inc. are dedicated to providing quality psychotherapeutic, educational, and consulting services to our clients, referral sources, and the greater community. We provide services to individuals, families, groups, and organizations of all ages, ethnic backgrounds, and sexual orientations. We value our clients and respect their rights to privacy. Contact our offices today to schedule an appointment with one of our counseling professionals. We work with men who suffer with Erectile Dysfunction (ED) and women who suffer from Female Sexual Dysfunction (FSD) to bring satisfaction back to their intimate relationships.. Our Sexual Wellness Team specializes in working with sexual addiction.